in light of that explanation, to suggest possible ways of improving agency performance in specific country contexts. Three South African infrastructural agencies are used to illustrate how the project’s empirical strategy might be applied: the agency responsible for urban passenger rail (PRASA/Metrorail); the South African National Roads Authority (SANRAL); and the country’s electricity supply parastatal (ESKOM). 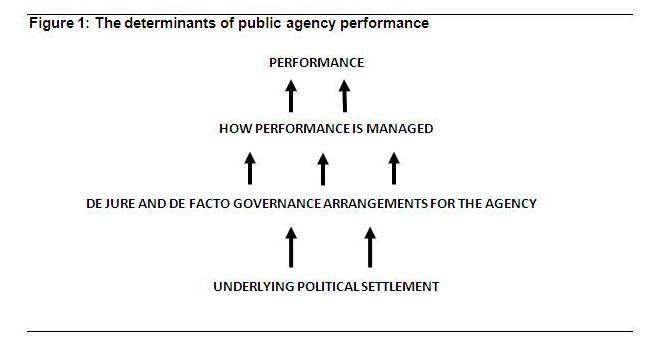 Which of the competing hypotheses as to the political drivers of agency performance outlined below prevails in practice is an empirical question. Given the ‘mixed’ character of South Africa’s political settlement, the answer may vary from agency to agency – with the observed empirical patterns offering insight into the character of the political settlement. Hypothesis 1: The performance of a public agency is a function of the de facto objectives set, monitored and enforced by the agency’s de facto principals. Empirical question 1: To describe the ‘left hand side’ variable – i.e. what has been the agency’s performance over time? Empirical question 2: To what extent have the agency’s managers and overseers managed for performance? How? How has the commitment to performance management shifted over time? Hypothesis 3b: Governance could be more complex, involving multiple stakeholders – but with the stakeholders collaborating effectively to set, monitor and enforce clear goals for the agency. Empirical question 3: What are the formal governance arrangements through which agency goals are met, and performance monitored? How have these changed over time? Empirical question 4: What were the de facto objectives of each of: (i) agency management? (ii) the agency’s oversight board? and (iii) the agency’s controlling ministry? How have these changed over time? Empirical question 6: Which external/informal stakeholders have an interest in agency performance? How, if at all, did these stakeholders endeavour to exert their influence? With what effect? How did this change over time? A detailed review of trends in agency performance over time. Detailed description, based upon primary and secondary materials, of evolving rules of the game with respect to the oversight arrangements for the agency – both formal and (as per points below, informal). Careful process tracing of key decisions and actions associated with point 3 (including ongoing operational and performance monitoring routines), as a way of identifying who were the key relevant actors, what were their incentives and behaviours, how they interacted with one another, and why the result emerged the way it did. These case studies form part of a larger, multi-country comparative analysis, falling within ESID’s programme 3, ‘the politics of social provisioning’. Note that performance cannot usefully be described independent of the goals which the agency is to pursue. In practice, the empirical work to address this question will thus need to assess performance across multiple dimensions. Some (e.g. cost efficiency) will be common across agencies, others will be specific to the agency and activity being studied. 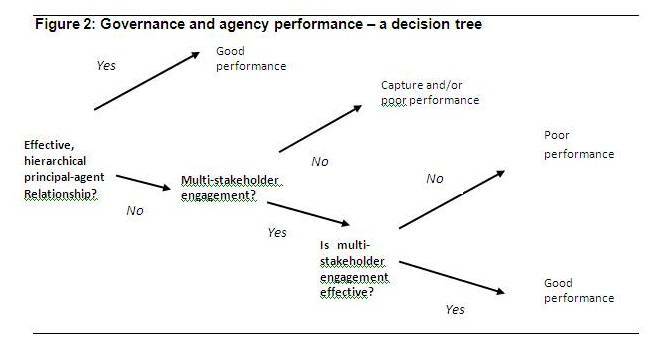 Note also the third (and fourth) possible paths along the decision tree – a failure of both hierarchical and multi-stakeholder governance, with poor agency performance the result.